Shop for flattering, fashionable looks in plus, extended plus, petite and tall sizes. Roaman's has the best selection of women's suits, dresses, sportswear, swimwear, shoes, intimate apparel and bridal gowns designed exclusively for women, size 12W and up. 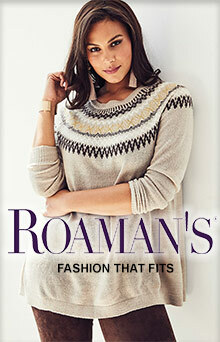 It's high fashion to be ladylike and that's easy with Roaman's extensive selection of beautiful styles.